​The 250 acre lake, referred to as Puddingstone Reservoir, has approximately five miles of shoreline and is divided into three activity areas: boating, fishing and swimming. An area for swimming is located on the South Shore of the facility and is open for swimming ALL WEEK from mid July 1, through Labor Day weekend. Lifeguards are on duty from 10 am to 6pm. The swim beach can also be accessed from your boat. There is a boat landing on the north side of the dock. Please remember that the cove is a 5 mph area. KEEP AFLOAT!!! 1. SWIM ONLY WHEN LIFEGUARDS ARE ON DUTY. 2. STAY INSIDE DESIGNATED SWIM AREA. 3. NO BOARDS, INFLATABLE RAFTS, OR INFLATABLE SWIM AIDS, ETC. 4. NO SAND OR ROCK THROWING. 5. NO CLIMBING/SITTING/STANDING ON SHOULDERS OF OTHER SWIMMERS. 7. DO NOT SWIM WITH LONG PANTS, SHOES OR LONG SLEEVE SHIRTS. YOU HAVE BEEN CONSUMING ALCOHOL. PROXIMITY AT ALL TIMES. KEEP YOUR SWIM BEACH OPEN!!! 10. NO FISHING IN SWIM AREA. 11. TODDLERS/CHILDREN ARE NOT TO ENTER THE WATER UNLESS THEY ARE WEARING "SWIM DIAPERS". 12. KEEP YOUR PETS ON A LEASH AND OFF THE BEACH. 13. PLEASE PLACE LITTER IN WASTE CONTAINERS. 14. NO FIRES OR BBQ'S WITHIN 50 FEET OF THE SHORE. PLEASE DISPOSE OF HOT COALS IN THE PROPER RECEPTACLES. 15. NO GLASS BOTTLES OR CONTAINERS. THE LIFEGUARDS WALKING THE SHORELINE OR GO TO THE LIFEGUARD STATION. LIFEGUARDS HAVE THE FINAL AUTHORITY IN ALL MATTERS REGARDING SWIMMING AND BEACH ACTIVITIES. OTHER ACTIONS NOT MENTIONED IN THESE RULES MAY BE DEEMED UNSAFE BY THE LIFEGUARDS. 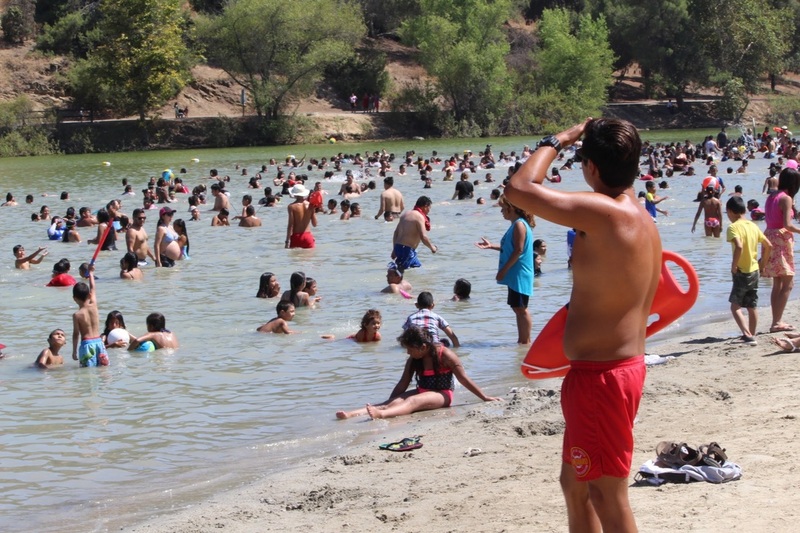 LIFEGUARDS HAVE THE AUTHORITY TO EJECT SWIMMERS AND ISSUE CITATIONS WHEN NECESSARY (L.A.CO. ORDS. 17.04. 010-90-140-200-220-250-360-530). OPEN: Thursdays through Sundays only, starting mid June - through Labor Day Weekend.